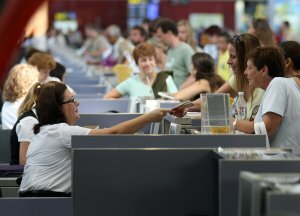 Costa del Sol Airport has hosted in July 1,529,286 million passengers, representing 0.3 % more than the same month last year, despite the negative trend of the Spanish airports, which have lost in July 4.2% of passengers with respect to 2011. The third airport in Spain by passenger volume and the main gateway for international tourism in Andalusia and the Costa del Sol hosted most of its passengers, 1,522,644 million, in commercial flights. Of these passengers, more than 250,000 travelled to other Spanish cities, with a drop of 5% over the same month last year; while more than 1.2 million passengers travelled on international flights, mostly to and from the UK, Germany and France, with an increase of 1.2%. The busiest days at the Malaga airport grounds were the first and the last weekend of the month, especially on Saturday 28th of July, which was the day with greater intensity, with 424 flights and 57,000 passengers in one day. Between January and July, the airport of Malaga-Costa del Sol has recorded nearly seven and a half million passengers, 2.1% less than in the first seven months of 2011.